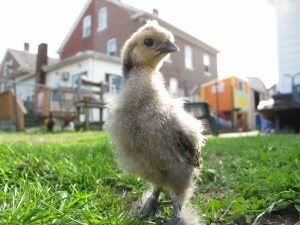 One of Bex's Burlington County chicks. Philadelphians, beware! There’s a growing population of outlaws among us. Members of our community who are on a mission to improve their own health—and maybe save a couple dollars while they’re at it—have taken urban farming to another level. How? By raising chickens in their backyards. Regardless of the fact that keeping livestock on properties less than three acres in size is not permitted by law, backyard chicken farming has made its way inside Philadelphia’s city limits and the practice is only increasing in popularity. Before I go on, I’m going to out myself as illegal chicken farmer. I’ve been raising chickens on my very tiny 0.08-acre property for a couple years now and I’m completely addicted to my hens and their super yummy eggs. The desire to feed my kids clean, organic food coupled with budget restrictions turned me onto organic gardening and then, eventually, onto the underground world of urban chickens. After a little Googling, I found at least a half dozen websites like UrbanChickens.com and BackyardChickens.com that not only gave me tips on how to build my own coop and raise baby chicks, but also on how to fight my local government if raising chickens is not allowed in my town. I picked up six chicks from my local farm store, stuck a coop in my tiny vegetable garden, and began my life as an outlaw. My little chicks quickly became members of the family – they all have names and (I believe) personalities of their own. Several months later, I found my first egg in the coop and rushed inside to fry it up. We’ve been enjoying breakfast courtesy of our pets ever since. When I look back, I remember seeing other chickens in my neighborhood while growing up. I live in a town predominately populated by Eastern European immigrants and their descendants, and many of the older folks used to keep chickens in makeshift coops under their back porches. Today, the old folks I remember are all gone and the chickens have disappeared. I had to turn to online communities to find support and advice on how to keep my chickens, and there I found a surprisingly large number of locals who are living undercover with their chickens. 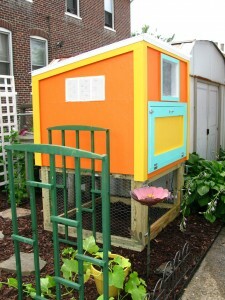 Current Philadelphia city codes only allow chickens (defined by the city as farm animals) on parcels of three acres or larger, but that isn’t keeping people from raising chickens on far smaller lots. First-time offenders can expect a fine of $150-$300 if caught, but according to animal control the code is rarely enforced without a complaint coming in from a neighbor first. The fine isn’t such a big deal, but the possibility that a beloved family pet may be taken away in an instant has Philly chicken owners looking over their shoulders and keeping low profiles. Philadelphia-area resident, Diana, is raising six hens in her backyard (and sometimes in her sunroom). Besides all the expected benefits that the chickens provide like fresh eggs, all-natural fertilizer, and chemical-free insect control, she lists entertainment and stress relief as two unexpected bonuses. To be honest, my chickens can cause a giant raucous in the morning when they’re doing their egg-laying thing, but are quickly quieted with some sunflower seeds. I have VERY understanding neighbors all around me, but then again, I’m cool with their barking dog, their kids who pick my flowers, and their late night summer drinking parties. We live in close quarters, so we tolerate all the craziness that comes along with that. And of course I’m constantly bribing them with fresh organic eggs to keep them quiet about the early morning clucking. The reality of today is that the economy is in the toilet, food costs are rising (especially those that rely on corn – livestock, processed foods, sweetened drinks), factory chicken farms are hotbeds for salmonella outbreaks, and the price of eating organic can still break a working family’s budget. If I can provide healthy, clean, cost-efficient food for my family while at the same time reducing my carbon footprint, I can’t see why I would make any other choice. The movement toward environmentally friendly self-sufficiency should be celebrated by municipalities, not held back or punished by fines. Backyard chickens are the ultimate modern-day pets: companions, gardeners, and food source. When is the last time your dog made you breakfast? My chickens feed my family every day. Rebekah “Bex” Borucki is a mother-of-three, a personal trainer, and an urban farming hobbyist raising backyard chickens and growing her own organic garden in a small urban space in Burlington County, New Jersey. You can find out more about Bex’ work and family on her website, BexLife.com.